Happy National Bookmobile Day! Today we celebrate bookmobiles and those who ride/drive them and provide mobile library services to their communities. The Free Library has two different mobile outreach vehicles including the Techmobile and our newly expanded fleet of Book Bikes. Over the past year, due to increased demand for Book Bike services, we acquired another custom tricycle from Haley Tricycles to tote and display books. We now have three Book Bikes serving communities in South, West, and Central Philadelphia. Last year our bike-powered mini-libraries visited a variety of events, with some of our favorites including Reading Terminal Market for storytimes, Parks on Tap, and Park(ing) Day. At these events we read stories, talked to passerbys about library programs and services, checked out books, and signed new patrons up for their own library cards. A couple weeks ago, I dusted off the winterized Book Bike at the South Philadelphia Library and went on an inaugural spring ride to a local elementary school. Here I showed third graders a selection of books that we have at their local library, and read them some Sideways Stories from Wayside School. One of the students came by the library after school to check the book out because he liked it so much! 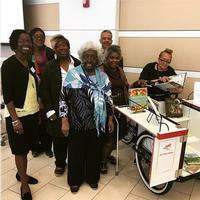 As with any bookmobile services, our goal is to reach people who may not be walking through our doors and to get them engaged with the library. This upcoming season, we have Book Bike visits scheduled at Farmers’ Markets, schools, Summer Reading events, and more! Keep an eye on our schedule of events as it evolves for the season. 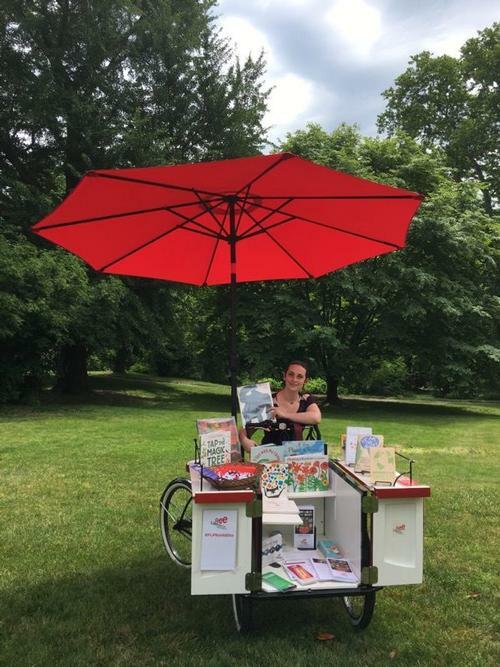 To request the Book Bike at your next event, school visit, or community gathering, send us an email at BookBike@FreeLibrary.org. As for our other bike riding friends, we also have Indego Urban Riding Basics classes starting again this spring at Parkway Central Library. See our schedule of upcoming classes and see you on the road! Editor's note: Link Ross was recently named one of this year’s Who's Next honorees in the field of public service by Billy Penn. Congrats! Actors from Living Well Theater at the Good Food for All Conference in Culinary LIteracy Center at Parkway Central Library. Lucien E. Blackwell West Philadelphia Regional Library staff riding Book Bike around the neighborhood. 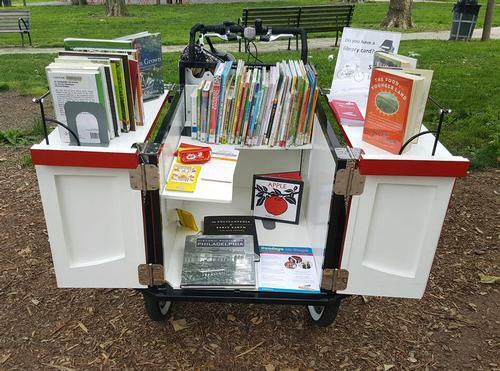 Add a Comment to National Library Week: Ride Along with the Book Bike!